A Yellow Springs Blog: Center Stage to offer Miller's "The Crucible"
Center Stage to offer Miller's "The Crucible"
Center Stage proudly presents Arthur Miller’s “timeless” tale, The Crucible. Written as a response to McCarthyism, Miller’s story tells the harrowing but still resonant tale of the Salem Witch Trials. The play is considered part of the bedrock of American theater, and Center Stage is excited to bring its vision to local and regional audiences in the unique setting of the First Presbyterian Church of Yellow Springs. Tickets are $10 at the door. Advance reservations are not available and seating is limited. Doors open at 7pm with audience members encouraged to arrive early to enjoy live ‘mood-setting’ music before the curtain rises. The Crucible is produced by Kay Reimers, on behalf of Center Stage, and directed by Lorrie Sparrow. This production features Brendan Sheehan, Kayla Graham, Ellen Ballerene, Aaron Saari, Thor Sage and Rob Campbell. Founded in 1971, Center Stage is the community theater of Yellow Springs, Ohio. 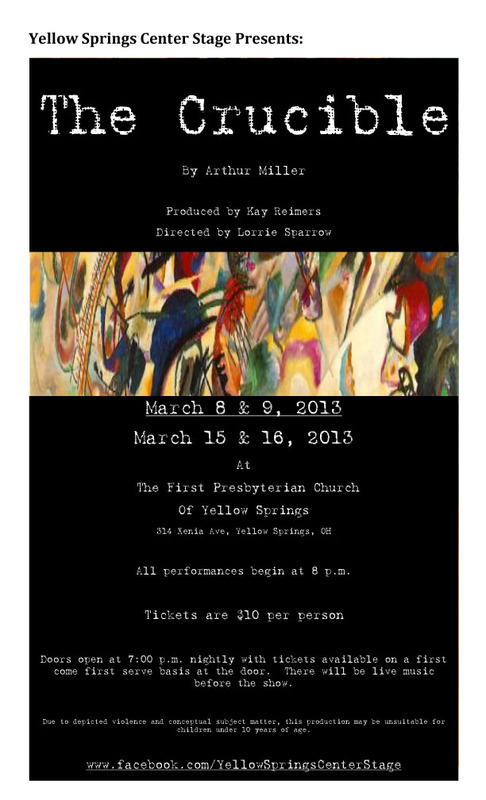 Center Stage is proud to produce both classic and new works in the creative community of Yellow Springs. Upcoming auditions for Center Stage’s next production, The Women (written by Clare Boothe Luce and directed by Rob Campbell), will be mid-March. 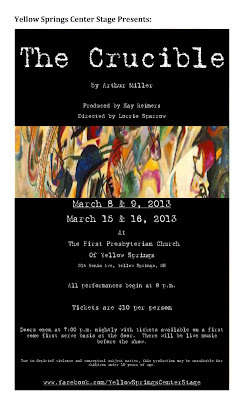 For upcoming events and submission guidelines for the 2013 Center Stage 10-Minute Play Festival, visit the Yellow Springs Center Stage Facebook page. Antioch Midwest to Screen "Escape Fire"